This course is for the novice user who has little or no experience with Microsoft Word except for our Word 2007 Basic 1, Basic 2, Basic 3, and Basic 4 courses. This is the last class in our Word Basics series before we get to the Expert material, so we have a lot of little topics to cover. We'll start with adding Drop Caps and Signature Lines to your documents. You'll see how to insert the Date & Time into your document, and how to make it automatically update itself each time your document is loaded (or not). We'll learn how to insert non-standard Symbols into our documents. Then, we'll take a look at the Equation Editor which is great for teachers (and math geeks like me). 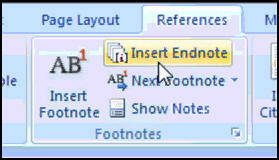 You will next learn how to add Footnotes and Endnotes to your documents. We'll also see how to get them to automatically renumber on each page. We'll see how to use Word to create envelopes. We'll talk about addressing them, saving your return address, electronic postage, printing, attaching an envelope to your documents, and more. You will also learn how to create mailing labels. Whether you want to create a full sheet of return address labels, or just print out one label at a time, I'll show you some neat tricks. Finally, we'll take a look at just a few of the thousands of document templates available on Microsoft Office Online. 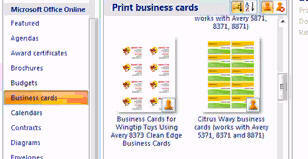 There are templates for greeting cards, memos, fax cover sheets, gift certificates... you name it. Again, this is the perfect class for anyone who is new to Microsoft Word 2007, and has finished my Word 2007 Basic 1, Basic 2, Basic 3, and Basic 4 courses. If you have little or no experience with word processing, or you just want to get familiar with how Word 2007 works, this class is for you. Richard Rost on 11/6/2009: Now that you're finished with the Word Basic series, visit our WAITING LIST and let us know what topics you'd like to see covered in the upcoming Word EXPERT series. Lisa on 10/22/2010: Richard, I know this will probably be for an expert class but I desperately need to know how to create a drop down list from the Developer tab. I have tried everything and it just isn't working. Doris Rosenhaus on 2/19/2013: I appreciate very much the manner in which you EXPLAIN the lessons -- you have a knack for it. Will a Word 2013 class be coming out soon? Sara Sherman on 11/13/2013: Can I watch the online home theater again at anytime? 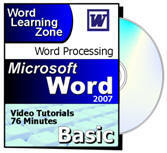 I just finished watching Word 2007 Basic Level 5, and would like to view it again at a later date. Yes. There is no time limit. You can watch your courses as many times as you want. The only restriction is NO SHARING, please.